It’s not hard to imagine that eliminating an entire kingdom of life (Animalia) could result in a deficiency somewhere down the line, if – let’s say – that kingdom was a phenomenal source of a particular nutrient. Such is the case with vitamin B12, an important nutrient concentrated in foods derived from animals, like meat, milk, eggs, fish, and shellfish. What makes sense intuitively has been confirmed by research: those practicing vegetarian or vegan diets are at greater risk for vitamin B12 deficiency than omnivores (1). Now, this isn’t to say that only vegetarians and vegans are at risk, as other groups prone to deficiency include the elderly, those who lack intrinsic factor (a substance produced by stomach cells necessary for absorption of B12), and those who do not produce enough stomach acid. Generally speaking, however, individuals who abstain from animal foods, without securing and consuming alternative B12 sources, may find themselves deficient. Why is this important? Vitamin B12 is necessary for the metabolism of cells in the gastrointestinal tract, bone marrow, and nervous tissue. Additionally, it works with folate in the synthesis and regulation of DNA. Deficiencies can lead to impaired cell division, permanent nerve damage, and pernicious anemia. The current RDA for vitamin B12 is 2.4 mcg (μg) in individuals 14 years and older. It’s not always easy to discern which foods contain a form of B12 usable by the human body. A quick look at some nutrition labels may reveal the presence of vitamin B12 – for example, in the cyanobacterium sprirulina – however, what some foods actually contain is a biologically inactive form of B12, known as pseudo-B12. Vitamin B12 and pseudo-B12 are not the same; only the former is biologically active in the human body and therefore able to correct deficiencies. How are we to know which foods contain active vitamin B12, especially when some plant food nutrition labels make this claim? New research has fortunately uncovered important information regarding this particular subject, and it looks like certain wild foods may offer assistance to those experiencing deficiencies (2). Various wild algae are consumed by humans all over the world. Algae are rich in certain nutrients like iron, iodine, vitamin C, manganese, and folate. Two of the most widely consumed algae – green (Enteromorpha sp.) and purple (Porphyra sp.) lavers – are also great sources of biologically active vitamin B12, containing approximately 133 μg per 100 g dry weight. Research has shown that consumption of dried laver, also known as nori, can prevent vitamin B12 deficiency in vegans. The fungal kingdom is often overlooked when it comes to diet and nutrition, yet research has been continuously unraveling important nutritional and medicinal properties of certain fungi. While many common mushrooms contain little to no vitamin B12, two species in particular contain adequate amounts. 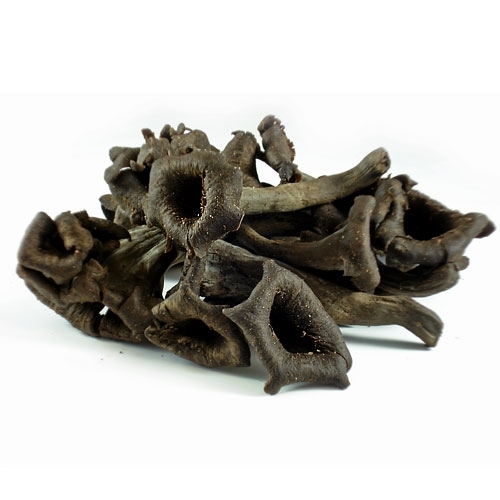 Black trumpet (Craterellus cornucopioides) and golden chanterelle (Cantharellus cibarius) mushrooms contain considerable amounts of biologically active vitamin B12 (1.09−2.65 μg/100 g dry weight), and may improve vitamin levels in those experiencing deficiencies. In addition to the aforementioned organisms, most wild animals contain biologically active vitamin B12, concentrated especially in the liver and kidneys. Popular shellfish, such as wild oysters, mussels, and short-necked clams are good sources of active B12. Other shellfish, such as abalones, ark shells, and whelks contain substantial amounts of pseudo-B12, and are not recommended to correct deficiencies. In general, consuming quality whole foods is the best way to ensure optimal levels of any nutrient, as no vitamin or mineral exists independently in nature. For those who do not ingest adequate amounts of B12-containing foods (wild or cultivated), supplements are effective in increasing circulating levels. If supplementing, consider ingesting a B12 supplement independent of your full-spectrum multivitamin. Vitamin B12 in the presence of vitamin C and copper can become degraded as a result of oxidation. These degradation products can also further block the absorption of active B12 (3). If you suspect a vitamin B12 deficiency, consider having your levels checked. Develop a strategy that ensures optimal intake through possible routes of food and supplementation. And remember – animals tend to be the most concentrated food sources of active B12, though there is indeed hope, provided by our wild algal, fungal, and bacterial friends, in correcting deficiencies.